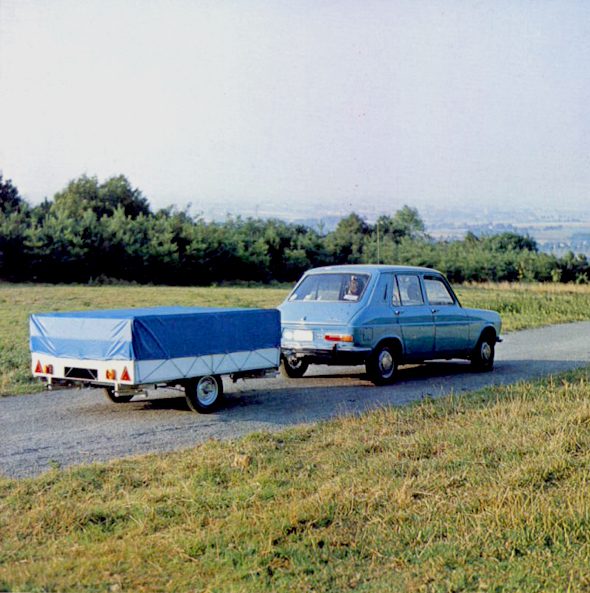 Moving on from this unfortunate experience Constant Rousseau imagines and produces, a caravan formed of folding panels resting on a chassis that can serve as a trailer for the rest of the year. Every subsequent summer, he developed a new prototype to test during family holidays. 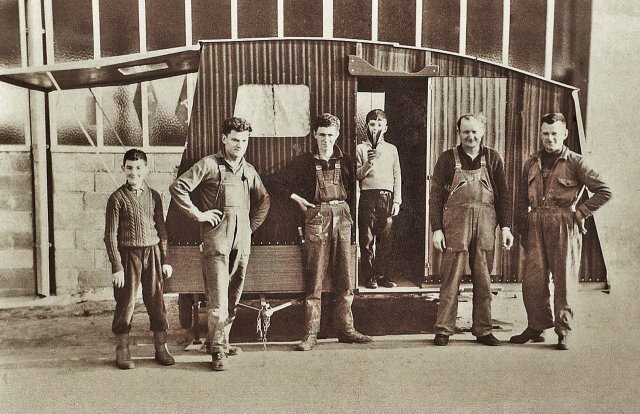 Perhaps reflecting on bitter early experience, the first caravan’s canvas enclosure was abandoned as Constant Rousseau decided to design a caravan formed of rigid man made plywood panels that broke the mould from the existing production conventions. Indeed, were it not for his own caravan holidays Constant Rousseau might have continued his work in the family carpentry business alone, however, the societal development of paid leave from work, indirectly led to a new demand for recreational vehicles. 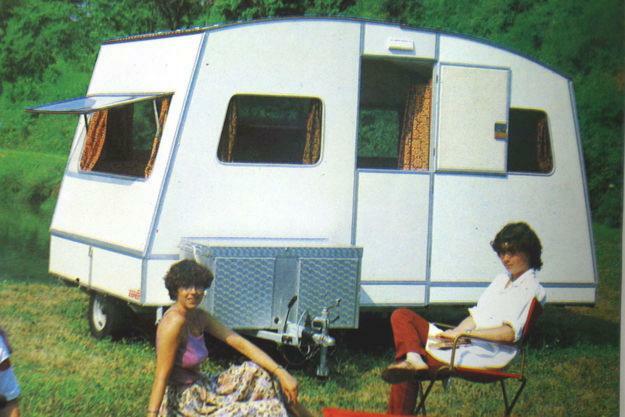 Since the early 60’s, there was an increasing desire for caravans designed specifically for those with limited home storage space as well as a caravan that towed more safely, and more fuel economical than the conventional, traditional towing caravan. 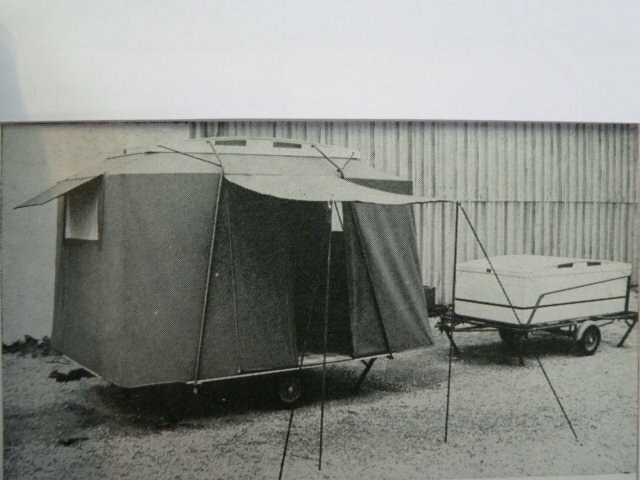 Rousseau took up the mantle of creating a true ‘folding caravan‘, and they were an instant hit when onlookers saw it on campsites. This sensation is what then drove the inventor to patent his idea and commercialize it. 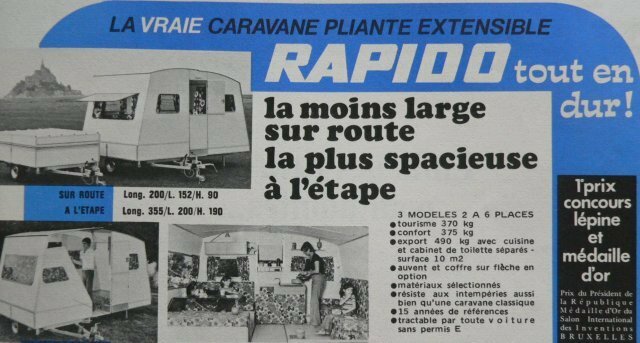 Returning from a holiday in Italy during the summer of 1961 the name was found, inspired by the caravan’s ease of assembly and therefore its speed of implementation: it would be “RAPIDO”. 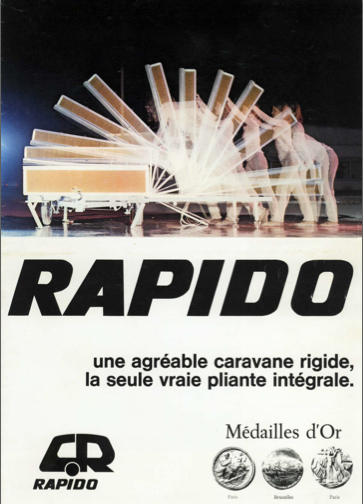 The Rapido was then presented in numerous exhibitions of inventions, receiving much attention for the tricks that make the caravan unusual. 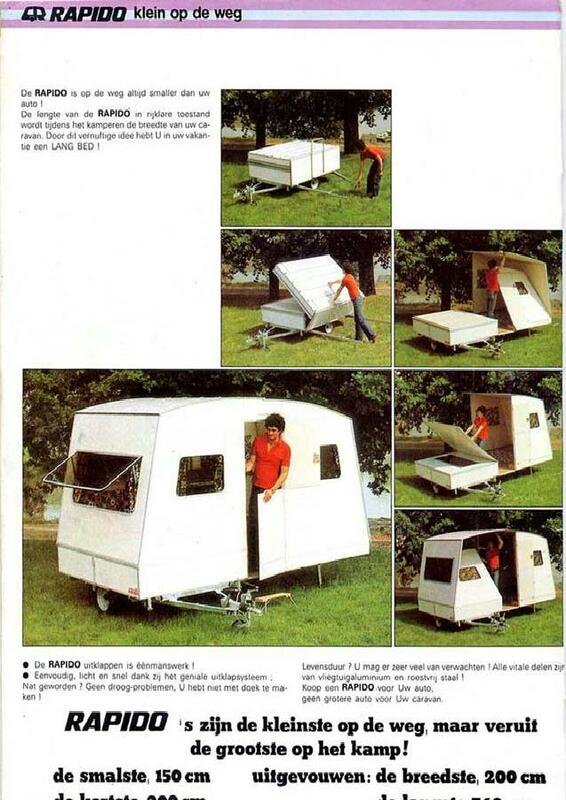 By perfecting the design every year, the folding caravan fascinated many and received several awards for its ingenuity and ultimately this innovative model was manufactured for almost 30 years resulting in 34,900 being made. RAPIDO was not only designed to be very small on the road, its ingenious folding system allowed it to double in footprint size when unfolded. On the road, the rear visibility was still intact in the rearview mirror and offered reduced wind resistance in comparison to a caravan that additionally provided a very low fuel consumption. 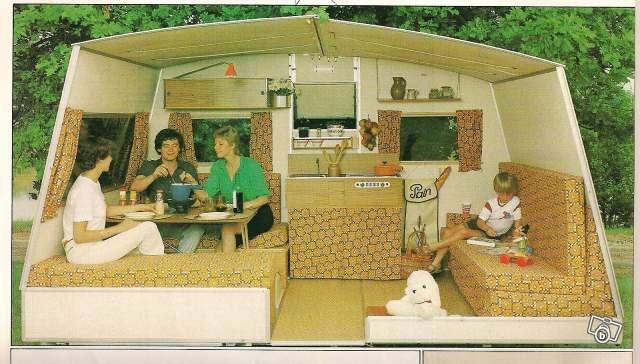 The Rapido Confort as it became known, would comfortably sleep four people on two double beds. With a six foot settee, a two burner cooker with grill, a sink, plenty of storage and a fixed table which could at a push, seat six, was quite surprisingly spacious. The Original Confort had to be folded and unfolded without the aid of a clever sprung system that was introduced in the later ‘Matic’ versions. Both could however be tipped on their sides for winter storage. 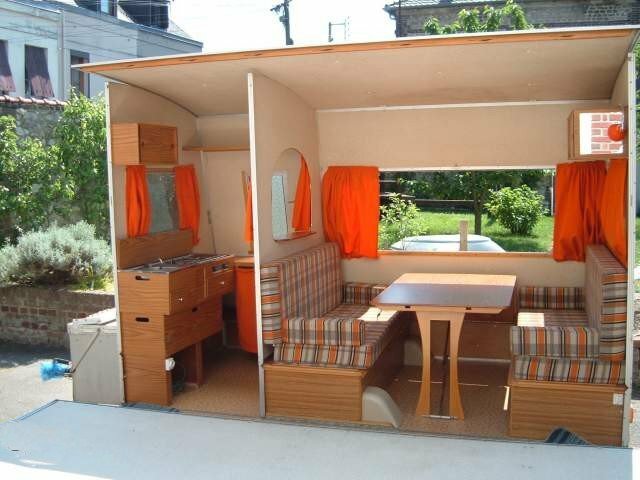 Back in the early ’70s, the range expanded with two new models that are larger and more spacious: the Rapido “Record” with additional facilities of cupboards, mirror, and a wardrobe, and the Rapido “Export” with a separate kitchen and a serving hatch. The Record could sleep up to six when fitted with bunks, but was a very comfortable, spacious four berth with two double beds. As well as a two burner cooker with grill, a sink, work top, plenty of storage cupboards, 4/6 seater dining table, and a six foot settee, the Record had a fixed wardrobe, which all added to a home from home feeling. A good family car had no problem towing the Export. Once on site, this big spacious 6 berth van had all the features of the Confort, the 6 seater dining table, and six foot settee, two double beds, plus 2 bunks, and plenty of storage space. What sets the Export apart however was the separate kitchen, which housed a two burner cooker with grill and sink, and the separate toilet closet/wardrobe. The spirit of creativity that Rousseau possessed, was intelligent, communicative, and resourceful. He was constantly looking for ideas and new manufacturing methods. Just as he reached the finished product, he was already thinking to evolve, to improve it. In order to observe the unique RAPIDO, which manages to evoke a smile and curiosity when seen in action, and to reflect on how delightful these very clever, highly functional industrial collapsible designs can be, click on this link to YouTube and see one unfold in less than two minutes! Delighted to find your page about the brilliant Rapido. Hubby and I bought one for a measly 175 gbp about 5 years ago. She had been cruelly treated, slammed down, bending her underside, scraped and scratched. We’ve done the important repairs and revamped the interior, putting in a totally collapsible loo cubical, and work continues, gradually replacing what the previous owner had damaged. We call our Rapido Vanessa, and have added a jolly red pop up gazebo, which we call The Pub Garden. We have friends who own a better cared for Rapido, in it’s glorious garish fabrics, and they too have adapted the van to have a loo cubical. I cannot think why there are not people clamouring for these genius “Hotel Rooms”. But shh, what am I saying. They can be our secret!